Bangor University has been crowned University of the Year for its work with the business sector and won two other awards at the Business Insider Awards ceremony in Cardiff last night (3 November). 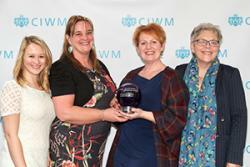 Also on the same night, the University received an award for sustainability campaign by the Chartered Institution of Wastes Management (CIWM) at an event in London. Nominated for a total of four awards by Business Insider, Bangor University was the big winner on the night, being named University of the Year and bringing home awards for New Process, for its collaboration with Sain (Records) Ltd and the Partnership Award, for its lead role in the KESS II programme. The coveted University of the Year Award was awarded for the strength of the University’s industry collaborations. The University has recently signed partnerships with Horizon Nuclear Power and Siemens Healthcare Diagnostics, adding around £250 million to the region’s economy. The New Process Award went to a partnership between Bangor University and Sain (Records) Ltd. Under the guidance of Dr Steffan Thomas from the University’s School of Creative Studies and Media, Sain (Records) Ltd have ventured into the e-commerce market. As a direct result of the partnership with the University, a new dynamic website was developed and links were established with digital distribution partners across all major digital stores, such as iTunes, Amazon and Spotify. As a result of a data structure overhaul conducted by Dr Thomas on the company’s digital catalogue of music – totalling over 18,000 tracks – content can now be exported to all major digital distribution companies within 4 days of an album’s release. The Partnership Award went to the Knowledge Economy Skills Scholarship II (KESS II). Set up in July 2016, at the time of submission to the Business Insider awards, KESS II had 83 live projects, 137 approved to start in October 2016 and had worked with 215 companies and other organisations in Wales. Led by Bangor University on behalf of the Welsh Higher Education Sector, the Scholarships focus on development within the European Convergence Programme. They offer Research Masters and PhD students the opportunity to be linked to a company partner, with scholarships supported by the European Social Fund. Receiving the Award on behalf of the team were (left-right) Lizzie Basterfield, Rebecca Colley-Jones, Deirdre McIntyre and Dr Einir Young.In another capital city on the same night, the University was recognised for its #LoveYourHalls sustainability campaign by the Chartered Institution of Wastes Management at their Sustainability and Resource Awards. The #LoveHalls campaign, run by the Halls' ‘Residential Life team’ with expert guidance from the Sustainability Lab team, has created major savings for the University and students, and has led to significant donations to charities. Leading by example, the University has made savings of over £100,000 in a year, and generated individual savings for students by encouraging them to budget and plan their food shopping. The University and individual students have also been donating goods to charities for their use or re-sale. Judged by the most respected experts in the sector, these long-standing awards are given for outstanding achievement in the sustainability, resource and waste industries. They showcase projects, innovations and resource management endeavours from the past 12 months and are entered and sponsored by organisations and thoughts leaders from all over the UK who are passionate about excellence. Bangor University was the only university nominated and was shortlisted for two awards alongside national and international institutions such as Aldi and Jaguar LandRover.